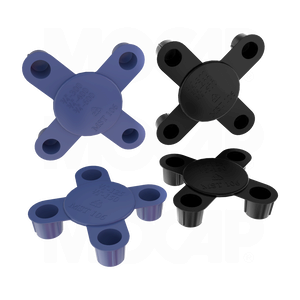 MOCAP Bolt Hole Flange Protectors are the most commonly used flange protectors in the industry. Our MBH series products provide for easy installation and removal and are designed to protect flanges from damage and contamination during transit, handling and storage. Our MBH Series parts are molded in black and blue LDPE plastic to fit 1/2" thru 12" nominal sized pipe flanges. MOCAP stocks Bolt Hole Flange Protectors in many sizes for immediate shipment.